Great People Never Die – Dreams Made Real Inc.
Today (Dec. 5, 2013) marks a historical day in which one of the greatest men to ever live has died. 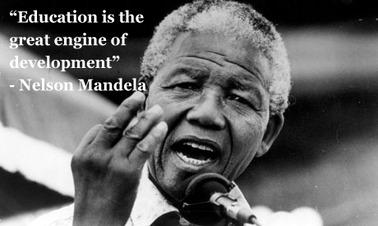 Nelson Mandela meant so much to his family, his country, his continent, and the world. He represented and stood for so many things. He inspired countless people, including myself, to never give up regardless of the odds. He showed us that “The System” can be beat and broken. He showed us the true meaning of perseverance. He showed us the power of education. He showed us much more! This blog, though, is not about his life because that is well documented. Instead, I offer a way to view his death and the death of other great people that God occasionally blesses the world with. We should see his death as a call to action. This is a time to really stand up for what we really believe. A time to understand how important education is and why it is so necessary to make sure that more people become educated. Take the principles and ideas that Mandela lived by and apply them to your life. Some people live to serve as an example for how the rest of us should lead our lives. Nelson Mandela was definitely one of those people. Great people like Nelson Mandela never die… for obvious reasons! Previous Previous post: DMRpresents: Compilation Album and Documentary! Next Next post: Vote Your Favorite Song Onto Our Compilation!